Sir Ian uses his normal accent to answer your questions. Someone asked me the other day. “Is Ian Bowler dead, then?” The relative silence of the galumphing, venal twonk since Christmas had led them to wonder if he had, perhaps, slid off this mortal coil like the yolk of a swan egg off the oiled fingers of a swan-egg-collector. Yesterday, he made his reappearance. Reports of his death had been greatly exaggerated. Mainly because I greatly exaggerated them to see what would happen. Because we were talking to various people about doing various things with him, and because I was doing a panto, Sir Ian went necessarily quiet for a few months. However, he’s now back, answering questions once a week, and preparing for his big show. Bowler, however, is a high-maintenance character. Most of what he talks about is topical, so his material dates very quickly. Nowadays, almost no one wants to hear his five-minute routine on the Alternative Vote system. But in mid-2011 it was ALL THE RAGE. By which I mean: A BIT OF THE RAGE. Which is where Melmoth comes in. Melmoth Darkleigh is a character I created as the host of the *cough* award-winning *cough* In The Gloaming podcasts. When all of the other performers dropped out of the In The Gloaming Live! show at the Arundel Festival because they had ‘work’, it became Melmoth’s one-man show, in which he channeled the ghosts that haunted the venue. Essentially, it was an excuse to exhume every character monologue I had, put them together, and drink a bottle of wine while I performed them. Before Christmas, I did a lot of work on mind reading for something I was working on, and that’s when it slotted into place. Melmoth should be able to read minds. Rather than just being a cheap excuse for a parade of character comedy, Melmoth should be a cheap excuse for a parade of character comedy and a few bits of mental magic thrown in. There should be a real spooky seance with inexplicable things, lots of dark Melmoth humour, and a few characters haunting the place. And made his first appearance at Comedy At The Cottage’s Comic Relief special a couple of weeks ago. It’s still quite newborn, pink, and tender, but I’ll throw it out to you anyway. Here’s the first taste of Melmoth Darkleigh, Mind F*cker! Sir Ian Bowler returns to the Internet, and will now answer your questions once a week. Talk to him! Sir Ian Bowler gives the Coalition response to the publication of the Leveson report. Yesterday, I wrote a blog post about how, in my view, Louise Mensch was misrepresenting the contents of the contents of the DCMS report into phone hacking. a misleading account of his involvement and influence with his newspapers. Bear in mind that this paragraph, although not all Conservatives supported the (Paul Farrelly) amendment that inserted it into the report, was not, they claimed, an assertion they could not accept. Only paragraph 229, Tom Watson’s amendment that included the “not a fit person” led them to disavow the whole thing. Which they did. Mensch herself called the report “fatally flawed” and “essentially worthless” (Newsnight, 1st May, 2012). So, the key question, to my mind is: does the assertion that Rupert Murdoch gave a misleading account to Parliament necessarily mean that he misled Parliament? Fortunately, someone asked just that at the press conference when the report was launched (start from 57:19 in the video below if it doesn’t do it for you). The question was asked as to whether or not giving a misleading account amounted to misleading Parliament. Paul Farrelly, who proposed the amendment that contained the paragraph, and who should know if anyone does, dodged the question. You’ve got the text there. And then he moved on to raise the wider point of the corporate misleading of Parliament for which the report holds both J and R Murdoch responsible. Which doesn’t really answer the question. And yet not only do the Labour members of the Committee allow other Committee members to present the report as if no such allegation has been made, but they refuse even to explain clearly what it implies when asked directly. We get a hint that it means what it says (“You’ve got the text there”) but an unwillingness to expound on it, clarify it, or even to insist that others mention it when describing the report. So, I’ll ask again. In the eyes of Tom Watson, in the eyes of Paul Farrelly, and in the eyes of Louise Mensch does giving a misleading account of your activities to a Parliamentary Select Committee amount to misleading Parliament or not? The most important thing to remember when you are on stage is that it is you who is on stage. You may find it difficult to forget, of course. You might find yourself gazing out over patient rows of expectant faces, your bowels curdling under the lights as the gags you expected would bring the house down drift aimlessly across the room only to sputter against the far wall like disappointed farts in a week-old balloon. At that point you might find it quite difficult to forget that it is you who is on stage. No matter what happens, remember that you have a right to be there, people have come to see you, you have the microphone. From the moment you walk on the stage – even if you are playing a meek and nervous character – you must own the space. It’s yours. Look at home in it. Try not to apologise for your presence. Nothing is more uncomfortable for an audience than watching an act who isn’t convinced that they should be up onstage. From the apologetic way in which they handle the microphone, to the sympathetic ear they lend hecklers, to the self-pitying murmurs of “This isn’t going well” when it isn’t going well, if the audience don’t feel that the person on the stage is in control of the situation it panics them. The only difference is that the fear your audience will feel will not be that of a fiery, ocean-bound death, but rather of an excruciating five minutes of comedy. All right, so it’s not really the same at all. But, still, it’s your responsibility to be in charge of the stage. To look like you know what you’re doing, even when you have know idea what you’re going to say next. Like Prince Philip. When we watched the video back you noticed that your body language changed when you were dealing with the heckler. You physically tried to move away from him and avoid eye contact to defuse the situation. However, comedy is occasionally quite territorial and mammalian. You have to assert your authority over the group using your wit. And the fact that they don’t have a microphone. You must become a silverback gorilla, throwing the weight of your enormous barrel-chest around, and grunting and hooting your authority to all challengers. 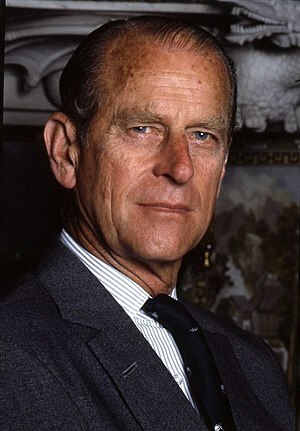 Like Prince Philip. You are the one who is meant to be there. You are the one people are there to see. Bear that in mind and straddle the stage like a smug giant, untroubled by doubt, secure in the knowledge that, undeserved or not, you are in charge of everything you cast your gaze upon. A while ago I was in a series of sketches for Comedybox and Channelflip called The Very Real Adventures of Batman & Robin. In them, I played Warren a disturbed stoner who attached himself to Batman & Robin, and… Ah, the plot’s not important. So, if you’re into minimalist Euro-electro with samples from obscure Web comedy serieses put to squelchy beats ad want to hear something vaguely disturbing, I suggest you go to Waterblip’s MySpace page, and listen to the track called ‘Right After’. Alternatively, you could mash yourself in the ears with a dessert spoon for three minutes and 16 seconds. One of the problems with writing a lot of topical comedy (and, in Tonightly, News Revue, the Treason Show, Insult to Injury and other places, I have ended up writing a LOT of topical comedy) is that is very quickly becomes non-topical non-comedy. Or: just words. I have reams of paper and digital giga-tonnes of files and folders full of sketches that only made sense for a week in 2004. And weren’t particularly good then. A couple of weeks ago I was asked to write a topical song about Tiger Woods. Any minute now we’ll all have forgotten who he is, so I thought I’d pop it up here while we can still remember what it is about (sort of). The week before last I made my first short story sales. Although both sales were at ‘pro rates’, they were short shorts, and so aren’t going to allow me to jet off into the sunset just yet. The first, a piece of Twitter fiction was published by @thaumatrope. If you like stories of fewer than 140 characters, I suggest you follow them immediately. If you want to dig through their timeline to find my story, they published it on February 21st. The other, somewhat longer story, is being published by Pseudopod and will appear in their podcasts closer to Christmas. The story they’re producing is ‘Hoofprints In The Snow’ which was originally a Minigloam on In The Gloaming and was part of the Black Static Advent Calendar.